Server: assists the priest and deacon at Mass; preparing the sanctuary prior to Mass and putting things away after Mass; ministry is open to both youth and adults, both male and female. At Cathedral Parish this ministry may begin in fourth grade. Commentator: in absence of deacon, this minister prays the General Intercessions. Gift Bearers: Catholic members of the assembly present the bread and wine on behalf of the community which will become the Body and Blood of Christ. While two people may participate, a family may present the gifts; the bread is placed in one vessel and the wine in one vessel. Reader: having received Baptism and Eucharist, the male or female reader proclaims the reading from Sacred Scripture. This ministry requires careful preparation with skills in clear and distinct pronunciation, strong projection, voice tone, pausing, eye contact, and prayerful proclamation. This minister possesses a deep love of Scripture, realizing that he or she is an instrument of God, for when Scripture is proclaimed, God himself is speaking to his people. 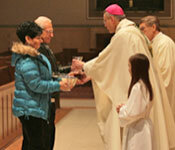 Extraordinary Minister of Holy Communion: fully initiated Catholic (having received Baptism, Confirmation, and Eucharist), male or female, eighteen years or older, approved by the Bishop, assists the priest in the distribution of the Body and Blood of Christ. This person possesses a deep love for and practice of the Eucharist. Because of their dependence on the Body and Blood of Christ, they reach out to the brokenhearted, the sick, the lonely, and those in need. This minister serves at Mass when ordinary ministers (ordained) are not available and may take Holy Communion to the parish homebound on a regular basis. Ushers and Hospitality: male and female members of the Parish of varying ages, who extend a kind word and warm smile to all who gather for Mass. Responsible for the collection of monetary donations; seating the people of God; and available for any emergency that may arise. 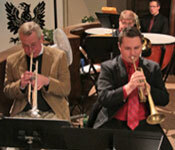 Instrumentalists: organ, piano, woodwinds, strings, brass, and percussion: these artists serve to enhance the worship of God’s holy people especially on special diocesan and parish feasts. Cantor: male or female gifted in musical ministry who leads the assembly in singing. This minister needs to practice regularly; tone quality, diction, projection, and a confidence in the musical selection are essential. Available for: Sunday Mass, Evening Prayer, Vigil for the Deceased, Funeral Mass, Committal, and special prayer services and liturgies. Psalmist: having received Baptism and Eucharist, male or female psalmist sings the Psalm at Mass, leading the people in their sung response. 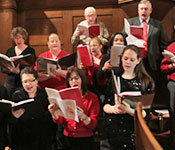 Choir: males and females who commit to weekly practices and singing at the Sunday Mass. Youth and adult choirs aid the assembly in full and active participation in the sung parts of the Mass; choirs prepare individual choral selections for appropriate times before and during Mass.